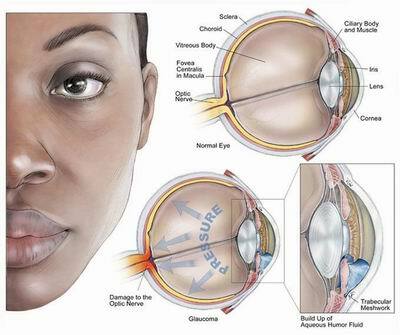 Glaucoma refers to a category of eye disorders often associated with a dangerous buildup of internal eye pressure (intraocular pressure or IOP), which can damage the eye’s optic nerve that transmits visual information to the brain. With untreated or uncontrolled glaucoma, you might eventually notice decreased ability to see at the edges of your vision (peripheral vision). Progressive eye damage could then lead to blindness. Glaucoma is often called the “silent thief of sight,” because most types typically cause no pain and produce no symptoms. For this reason, glaucoma often progresses undetected until the optic nerve already has been irreversibly damaged, with varying degrees of permanent vision loss. If you are having vision problems see an Ophthalmologist right away.